The ACC is staffed by pharmacists who are trained in anticoagulation therapy. These pharmacists monitor and manage the medications your medical provider has prescribed to prevent blood clots. of anticoagulation therapy on an outpatient basis. 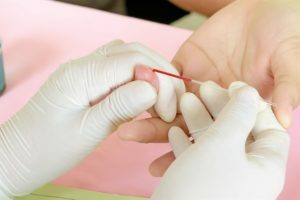 Testing is done using a simple blood test that is immediately processed at the Clinic. Results are ready within a few minutes. Your results will be used to adjust your medications if necessary. A trained pharmacist will spend time discussing why you are on anticoagulation medication. interactions between warfarin and other medications, vitamins and herbal remedies. Our pharmacists will answer any questions you have concerning your anticoagulation therapy. committed to improving the management of your anticoagulation therapy. each patient to make sure they are at safe and therapeutic levels. The frequency of visits is based on individual patient needs. Monday through Wednesday 7:30 a.m. to 5:00 p.m.
TALK TO YOUR PHYSICIAN ABOUT A REFERRAL TODAY! Click HERE for new patient referral forms.